Abby Ray captures muted colors reflecting the things we may not want to see in ourselves. Difficult emotions or harsh realities appear in her photography. She captures people at their most vulnerable state, and pays attention to beautiful details that the common eye may overlook. Abby uses post processing to produce unique color schemes and bold images Her inspiration comes from movie stills, horror being Abby’s favorite genre. Abby’s discovered her love for photography around age 15 when she took a photography course at Downers Grove South High School, After high school, Abby took photography classes at College of DuPage, as she earned an Associate’s degree in General Studies. Now Abby is a Fine Art Photography major at Columbia College in Chicago..
Abby plans to continue studying graphic design, and would enjoy a career working alongside musical artists or event planners to create “album artwork” or interesting event promotions.. 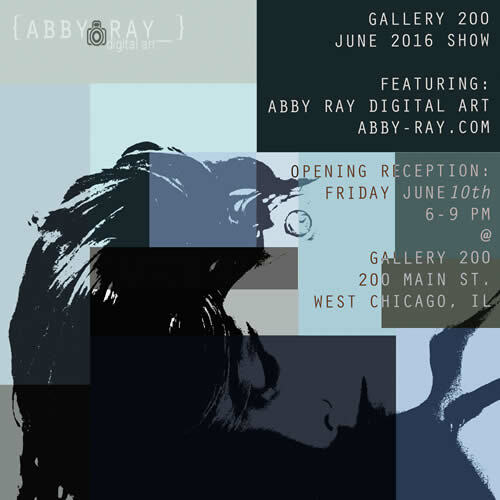 Enjoy light refreshments as you meet the artist, Abby Ray, on June 10 between 6 and 8pm. Abby’s unique photographs will be on display throughout the month of June. “My background is as a creative writer. This explains my fascination with the metaphors embedded in human experience. It has also served as the impetus for my exploration of the interface between written language and visual images. “While I was teaching middle school in California, one of my friends let me borrow his father’s Canon AE-1 manual camera to experiment with. I shot with that for a few months, without any technical knowledge or concrete idea of composition. I looked, pointed, and clicked. I did my best to shoot what caught my eye, beginning with my students as my subjects. The more I attempted to capture the essence of my children and their experiences on camera, the more my eyes seemed to open to the unobvious, the ironic, and the non-stereotypical. In looking more carefully, I was a writer who discovered another way to tell a story. Today, even after having studied and received formal training in photography, capturing the story is still of principal importance in my artistic philosophy. “Since I first picked up a camera in 2007, I have been fortunate to have a number of photos publically featured. “Sowing Seeds of Hope,” won 1st place in the 2009 Americorps National Photo Competition, my portfolio won 1st place in the 2009 Photographic Arts Society Competition, “You-We: The Canvas of Culture” won 1st place in the 2011 UWI Annual Photography Competition in Trinidad and Tobago and was featured on the university’s quarterly magazine, and “Repose,” which you see on this page, was a finalist in the 2012 Photographer’s Forum National Photo Competition. Thanks to various local grants and a Fulbright, I have had the opportunity to shoot both domestically and in the Caribbean. Sarah’s work will be on display throughout the month of June. For more of Sarah’s work see http://sarahannimages.wix.com/sarahann.